The forecast was again crappy; there was a 40% chance of thunderstorms (with a partly sunny icon) leading up to a 40% chance of thunderstorms (with a scary lightning icon) later in the day. NOAA was saying 5-9 knots wind, which we’ve accepted actually means somewhere between 0-2000 knots. But we’re sailors damn it, so we sailed. We continued our experiment on sailing on the jib alone, this time fully unfurled. The wind was such that we probably could have put up a reefed main, but we didn’t reef at the dock and we were really out for a lazy sail and did just fine on just the jib. It doesn’t point all that great and it requires quite a bit of tiller correction to go straight, but she sailed flat and we were able to make it up near 38 and back at an easy pace, sailing very comfortably. We were going to anchor in the cove behind Berkeley Island park, but gray clouds were building to the east. People who undoubtedly know more about the prevailing weather patterns on the bay than us were weighing anchor and booking out of there, so we decided to instead dock temporarily at Trixie’s and eat our lunch close to where we could haul out if it got nasty. I’ve got to figure out how to make daiquiris (the mixed drink, not that frozen nonsense) in bulk. I can make them great one at a time, but when I attempt to make a bottle’s worth it goes really poorly. That said, we had a good time and Christopher seemed to enjoy himself. 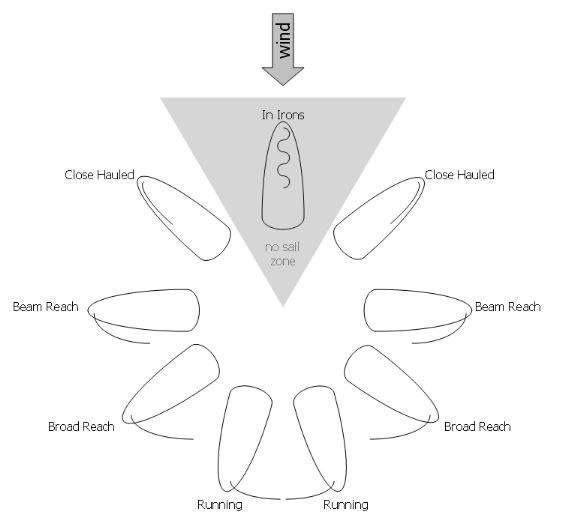 I think the next time we take someone out who wants to learn a little bit about sailing, we should take a points of sail diagram. I think it makes it a little easier to visualize what we’re doing, and it doesn’t hurt our understanding when we try to teach it to people.